For fourteen years from 1880 to 1894, Samuel White was the caretaker of the old University of Pennsylvania athletic fields at 37th and Locust Streets and of the small, frame training house on the southwest corner of these fields. An enormous man and a skilled boxer and wrestler, White was quite a presence on campus. Among varsity athletes in all sports, he was well regarded for his training expertise, and in particular for his skill as a masseuse. Known by students as “Sun” or “Black Sam,” White’s strong voice led the cheering for Penn’s athletes in the glory days of early Penn athletics. As athletics became an established feature of university life, the University of Pennsylvania began to invest in more elaborate athletic facilities and the hiring professional trainers and coaches for Penn’s varsity sports. 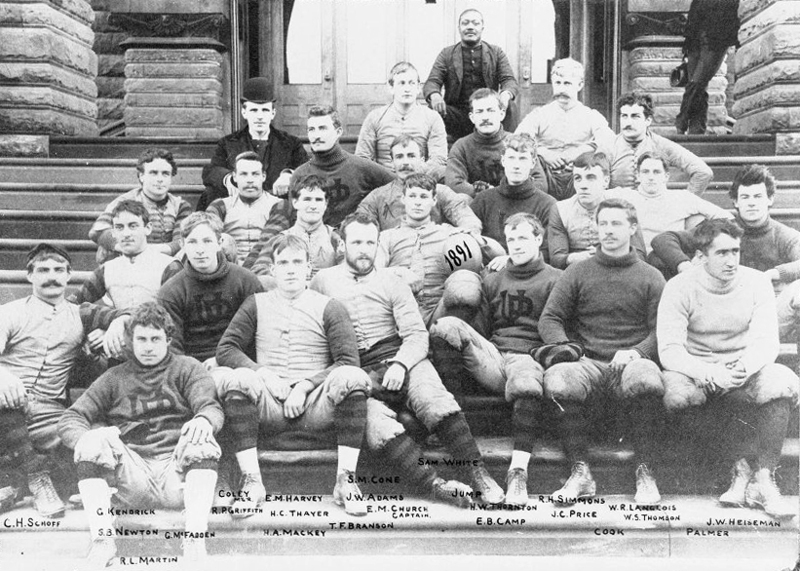 When the construction of more dormitories in the quadrangle led to the 1894 move of Penn’s athletic activities to Franklin Field, White left Penn to become a trainer of professional walkers and other athletes in the Philadelphia area. His abilities gained him fame among athletes all around the country, but he remained a regular sight at Penn athletic events. White was not yet sixty years old when he died from a heart lesion at the Hospital of the University of Pennsylvania on March 25, 1904, just days after the death of Albert “Pomp” Wilson, the other African American presence on the Penn campus during the late nineteenth century. Shortly before his death, Sam White commented to Dr. J. William White, “I’m glad that I can die here, at home.” White’s funeral was held at his home at 1310 Bainbridge Street in Philadelphia.